Helm - World In Action Remixed. Vinyl EP. Bleep. 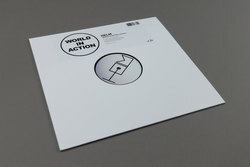 An all-star lineup comes together to rework tracks from Helm’s 2017 World In Action EP. The distorted and fragmented rave memories of that EP provide good jumping off points for the remixers here. Entries from Parris and Low Jack steer close to the same waters, with the former turning in a mutant free jazz/ragga hybrid while Low Jack’s take on ‘Candy’ is a taciturn piece of sound art. Laurel Halo and Beneath provide the most obviously club-orientated cuts. Halo’s version of ‘Blue Scene’ is a stunted, vaguely psychedelic techno offering, while Beneath’s usual bass-driven body music is ramped up to jungle tempo. Things close out with the digital-rendered sound pasture of Sky H1’s flip of ‘After Dark’.